This is the first non Indian pen I am going to review and i hope you all like the review and please leave the comments if you like. This pen actually took almost 4 months to come into my hand. Even though I have TWSBI 580 Al Orange but i was more excited about the ECO. This pen was bought from Frank of FONTOPLUMO. It was booked as soon as it was launched and Frank was kind enough to hold the pen for more than a month and he was even kind enough to hand over the order to a visiting friend (Kapil Apashankar) in Netherlands and i must also mention this that the pen was on hold despite me not making the payment. And in the end I bought not just Eco but lot more pens for myself which will be reviewed here slowly. Also let me take this opportunity to thank Kapil for taking all the pain of collecting the pens and sending it across to me from Pune. So this is review about TWSBI ECO. The pen came in a no nonsense plastic box and the pen and the accessories were well packed. I took the white color model. The pen currently comes in two colors: Black and White. However there are certain other colors being proposed by TWSBI on their blog. It’s a well designed elegant pen and even though it looks chunky when capped. It’s a beautiful pen when inked. The barrel is clear acrylic which is again of good quality and is circular instead of faceted design of TWSBI 580 or VAC. The grip section is also clear acrylic and you can see the ink flowing to the feed from barrel to section and feed. I kind of love the demonstrators. They actually take the color of the ink you put in. Looks lovely. The pen is actually one piece from grip section to barrel, only knob being different. Some people have not like the cap design but for me it’s just okay and carries the design cues from the faceted design of 580 or Vac. The cap and piston knob both have faceted design. All the trims are chrome silver finish and the centre band of the cap has TWSBI and ECO imprinted on the band. The best thing about the pen is the rubberized O ring at the joint of piston knob and barrel which really helps in secure posting of the Cap. One thing to be noticed here is that apart from the nib and cap clip there is no metal part in the pen. Also like the O ring at the bottom there is one more O ring at the front of barrel which ensures the Cap doesn’t slip of and is securely closed. Below image shows the pen capped and uncapped for comparison. The pen is just tad smaller than TWSBI 580 when it is capped. I love the pen and I believe there is no good quality piston filler demonstrator in this price range. Below are the few images showing the comparison of the pen with others. The pen is similarly prized as Lamy Safari and I believe this is better bet. The pen is very well balanced whether the cap is posted at back or not. Its a sizable pen and it is just a tad bit longer than 580 when posted. The pen posts really well and securely but for me its amazing when writing with cap not posted at back, but thats my personal preference. The pen is 139 mm when capped and 168 when cap is posted at back. Below are the images showing the comparison of writing with cap posted and cap unposted. The pen I am reviewing comes with friction fit 1.1 Stub nib and boy it writes so amazing. Loved the nib and the ink flow. 1.1 Stub gives you a crisp writing with lovely welcome feedback. I love it. Yes the nib is friction fit and is easily removable. Nib is #5 steel nib and option of EF, F, M, B and 1.1 Stub is available on ECO. The ink filling mechanism is via Piston which is the best considered ink filling mechanism. The pen holds almost just less than 2 ml of ink. The piston knob is easily removable via plastic wrench that is supplied with the pen. There is also silicone grease supplied with the pen. 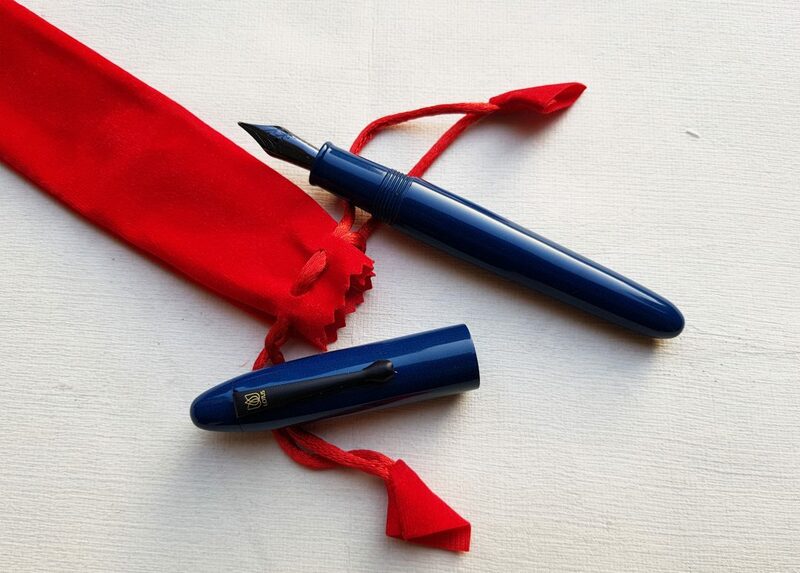 I am totally in love with this pen and the my iroshizuku ink looks stunning with this pen. The pen actually takes any color you want with the ink you put in the pen. Buy it – thats my advice. 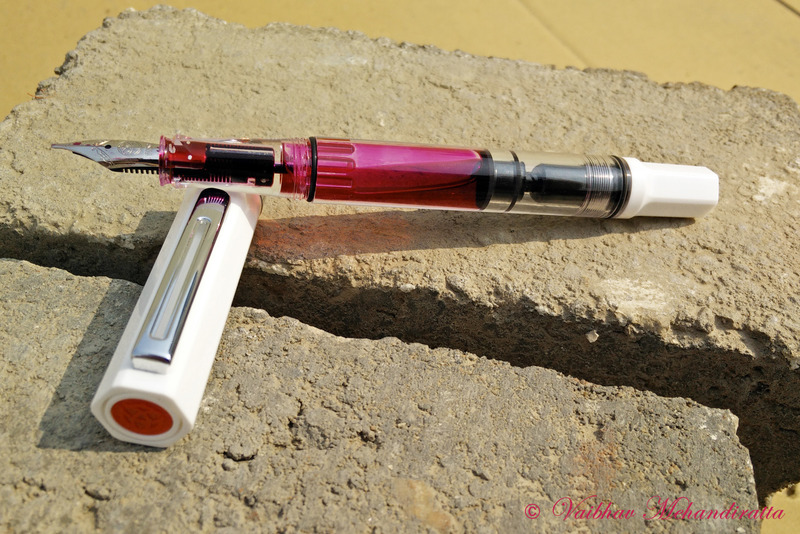 Beautiful quality product at surprisingly low price (25 Euros) with TWSBI lifetime warranty. Have you tried the Vac Mini yet – sounds interesting though may have some small issues. Whats the best place to get one in India? Online would mean intnl shipping costs and customs (sometimes its difficult to ask seller to label it as gift). Is 3600 a good price for this pen ??? No….. Buy it from fontoplumo.nl.. They are quite cheap.. But they are adding 17Euro for shipping now. Have you not encountered this? Wonderful review Vaibhav. Would you know if this pen is available in India? Beautiful review. Thank you. The Eco is maybe my favorite TWSBI. For me, the M nib is already wonderfully smooth and generous but you are making me wish for a stub! Great review, very informative. I do just want to mention that the Vac 700 also had a circular barrel, not faceted. But that’s a minor point. Well done! Lovely review as always brother ! Superb pictures. Great review, going to see if I can pick one up. Wonderful review as always Vaibhav and truly mesmerising pictures!! Thank you for this very thorough review, Sanjay, complete with excellent photos. I am particularly interested in the smoothness of the writing experience. Your statement of “crisp writing with lovely welcome feedback” makes me a tad worried that it didn’t feel very smooth, especially with a stub. For crisp writing with feedback, I turn to italic nibs. Another concern is the weight. Would you compare the weight of the pen (with ink in it) to the weight of Lamy Safari? Hi Vaibhav, Please excuse my confusing your name. Your reply is appreciated; I will probably give the TWSBI Eco a try.